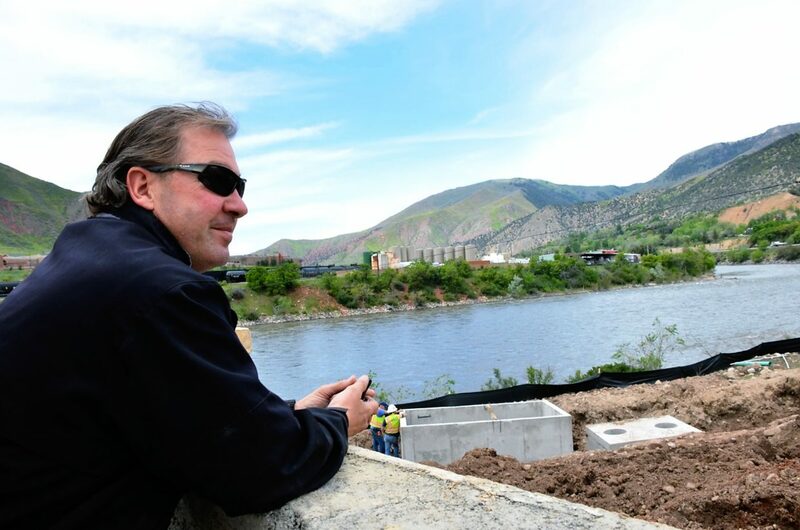 Steve Beckley, who reintroduced the public to Glenwood Springs' Fairy Caves 16 years ago, surveys the work now under way to reintroduce another of Glenwood's historic attractions, the Iron Mountain Hot Springs on the bank of the Colorado River. 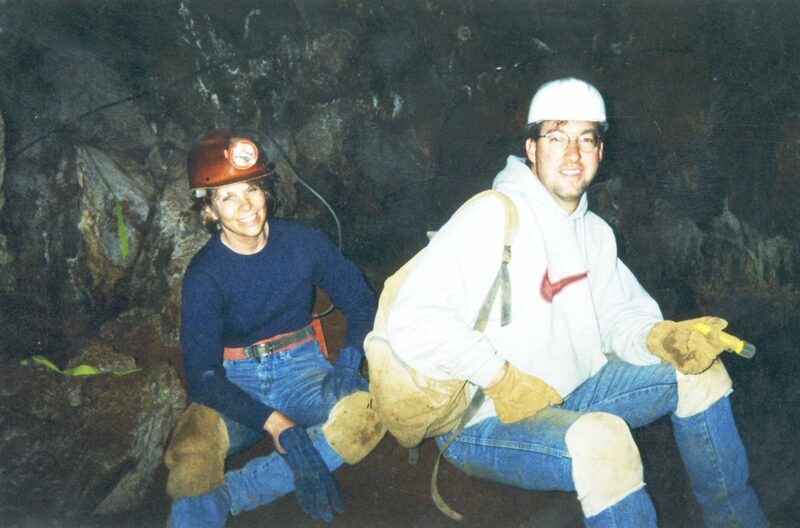 Steve Beckley and his future wife, Jeanne, on a date into the Fairy Caves on the side of Iron Mountain in Glenwood Springs in 1994, a few years before they acquired and opened the historic caverns to the public..
A young Steve Beckley in 1983, caving in the Guadalupe Mountains of New Mexico. 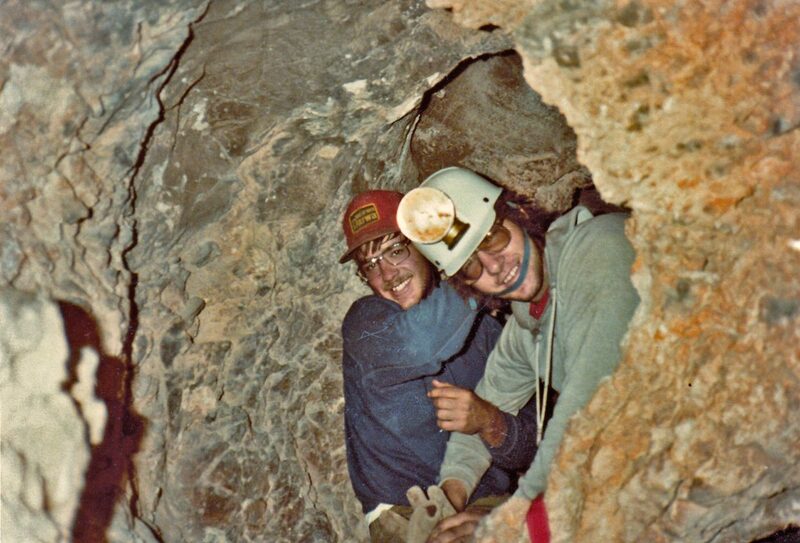 Steve Beckley, front, with friend and fellow caver Gary Harris in the Guadalupe Mountains of New Mexico, circa 1983. 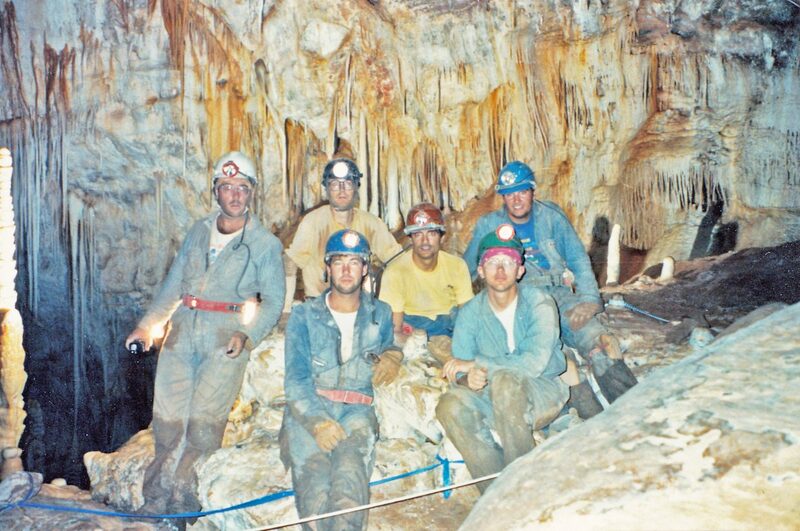 Steve Beckley, front, and friends in the Virgin Cave located in the Guadalupe Mountains of New Mexico, circa 1983. 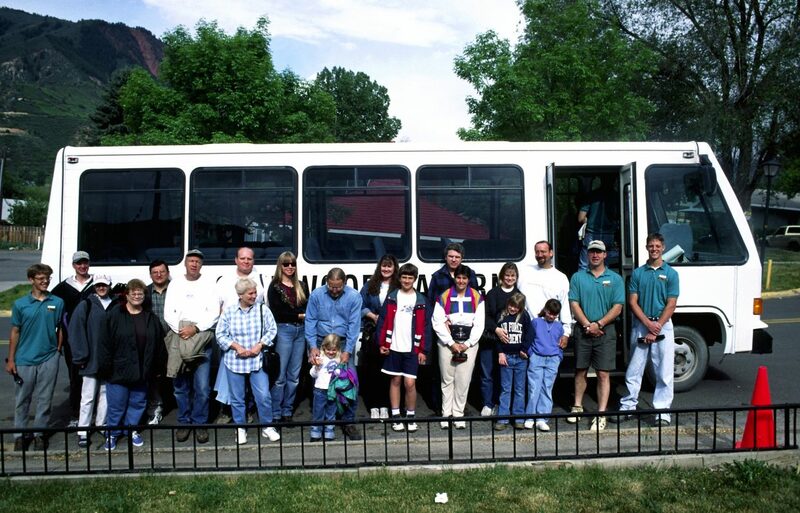 Some of the first visitors get ready to ride up to the reopened Fairy Caves in Glenwood Springs in 1999, before it became known as Glenwood Caverns Adventure Park. A conversation of any length with Steve Beckley will likely involve a geology lesson at some point. During a recent talk on the deck at the Glenwood Caverns Adventure Park, Beckley asks for a piece of paper and proceeds to draw the intricate link between Glenwood Springs’ historic caves and its world-famous hot springs. “These caves are unique because of the unique minerals that come from the hot springs,” explained Beckley, who with his wife, Jeanne, reopened the Fairy Caves on Iron Mountain to the public in 1999 after they had been closed off for 82 years. “In fact, there would not be a cave without the hot springs,” he said. These days, Beckley’s world is also intricately linked by caves and hot springs. After a successful 15 years running cave tours and developing what became known in 2003 as Glenwood Caverns Adventure Park, he has stepped away from the daily operations up on the mountain to focus on his latest adventure down along the Colorado River. There, work is proceeding to develop the Iron Mountain Hot Springs, a new attraction being spearheaded by the Beckleys along with Glenwood residents and real estate investors Mogli and Coop Cooper. Again, it’s more of a public reintroduction to the soothing hot springs water that for a century up until 1996 served as Glenwood’s second hot springs spa, in addition to the famous Hot Springs Pool located just up the river. “Glenwood Springs is really on the cusp of being a phenomenal destination,” Beckley says as he prepares for a late June opening of the new hot springs, which will feature a series of smaller pools ranging from 99 degrees to 108 degrees, as well as a larger family pool. “We have so much more to offer than most mountain towns, and it just keeps getting better,” he said. Beckley, who turned 53 on Friday, was born in Ogden, Utah, but “home” was a relative term. His dad was an engineer for the U.S. Bureau of Reclamation, working on various dam projects across the west in the 1960s and ’70s that took the family to wherever the next job was. Stints in Nevada, California and Idaho preceded their arrival in Colorado, where they eventually landed in Cortez when Steve was 15. He graduated high school in Cortez, and went on to attend the Colorado School of Mines in Golden where he studied to be a petroleum engineer. It was also while Beckley was a freshman at Mines that he got into caving. His first cave adventure was the Fault Cave outside of Golden, and he proceeded to explore caves all over Colorado and around the country with some of his college buddies. 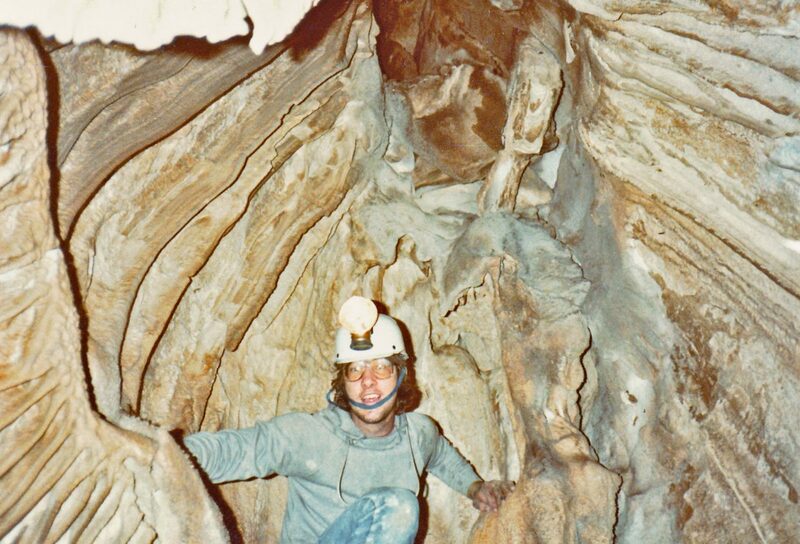 His studies led to a 12-year career in the oil business, beginning with Amoco in New Orleans for three years, where he had a chance to visit several caves in the southeastern states. Later, he ran an oil field in Redondo Beach, Calif., before starting his own company in Denver. “It hasn’t been all about the caves for me, but that’s certainly been the fun part … petroleum engineering isn’t as fun as caving,” Beckley said. But it was that early career that earned him the venture capital, or perhaps it should be called “ad-venture capital,” to eventually buy the Fairy Caves. Most of Beckley’s oil interests have been in Kansas, where he still has about a dozen wells. He sold some of them off in the late 1990s when the cave deal finally came to fruition. “I read an out-of-print book called ‘Caves of Colorado’ in 1982 when I was at Mines, and it mentioned the Fairy Caves and how they were going to be reopened and made into a commercial cave,” Beckley said. But nothing had been done up to that point to make that happen, so he called up the owner of the property at the time and asked how he could get involved. It was about a dozen years later before he was allowed to enter the caves for the first time. He brought along soon-to-be wife Jeanne for a date, which involved “belly crawling” into the Fairy Caves. “I told her then that I wanted to build it into a commercial cave so we could show people what caving is really like,” Beckley said of the original cave tours into the main room and King’s Row before the other live caverns were explored and eventually opened as well. Today, there are about three and a half miles of caves descending some 300 feet into Iron Mountain that are open to the public for walking tours and the more wild crawling tours. Beckley figures there are probably another 15 to 20 miles within the cave system still to be explored. After that first cave experience as a college freshman, Beckley was hooked. “I started caving with my buddies every chance I could get,” he said of their adventures all around Colorado and in the Guadalupe Mountains of New Mexico, home to the famous Carlsbad Caverns. After college, he explored caves in Tennessee, Alabama and Georgia, and has caved in Jamaica, Puerto Rico and Mexico. “I’ve found a lot of cave passages in the U.S., but this cave has provided me with the most discoveries,” Beckley said of the cave network above Glenwood Springs. When he and Jeanne decided to reopen the Fairy Caves as a commercial venture, Beckley also began touring as many commercial caves as he could find, including the family owned Marvel Cave at Silver Dollar City in Branson, Mo. The Adventure Park concept was born in part from that visit, as the addition of several rides and other attractions was modeled after the theme parks that have come to accompany many of the commercial caves in the U.S.
“We had 500 people the first day we opened the Fairy Caves, and it just got more popular after that,” he said of the Caverns which drew 30,000 people that first year and has grown with the addition of the Adventure Park rides to around 185,000 visitors last year. As waits for the cave tours grew to three hours, the various rides and other attractions became a way to give people something to do while they waited. The thrill rides, including the Alpine Coaster, Giant Canyon Swing and Cliffhanger Roller Coaster, are as much an attraction now as the cave tours. And the caves themselves are as pristine as they were when they first opened, Beckley said, thanks to a computer monitoring system that helps the cave managers maintain the perfect temperature and humidity. “Kings Row still looks the same way it looked when we first opened it, and that’s an amazing feat,” he said. Glenwood’s caves have also drawn the likes of renowned microbiologist Hazel Barton who has discovered 56 unique species within the local caves. Beckley said he first began learning of the history behind the Iron Springs property between the Colorado River and Interstate 70 west of Two Rivers Park in about 2005-06. At the time it was under contract to be sold for a condominium development, but that plan fell through when the recession hit a couple of years later. Beckley, however, began negotiating with owners Pitkin Iron Co. to buy the old limestone quarry site at the base of Iron Mountain, which he has preliminary plans to eventually develop into a hotel and mining museum. “That really laid the groundwork for buying the hot springs property,” he said, crediting the Coopers with pulling the deal together. Developing the hot springs did require a deal with the Hot Springs Pool for the rights to use some of the spring water that also serves to feed the big pool. Meanwhile, Glenwood Caverns Adventure Park was recently named a finalist for the U.S. Chamber of Commerce small business of the year award, and in March was named the Glenwood Chamber Resort Association’s Top Brass Business of the Year. The Beckleys are also busy raising two teenage boys, Shane, 16, who attends Glenwood Springs High School, and Stenar, 14, who goes to Carbondale Community School.